When it comes to making a complete meal for the whole family, a lot of time a preparation goes into your food. No matter what kinds of dishes you create, you have to chop, slice, knead and mix everything so that it will be perfect for everyone to enjoy. In our search for the best food processor in India, we decided to look at models that can aid you in the kitchen as much as possible. Instead of having to do things by hand, you can rely on a single machine to make your life so much easier. So, with that in mind, let’s take a look at what we’ve found. If you’re like any regular family, you have to make food for a lot of people. That means that you want to get a processor that can make enough in one sitting so that you don’t have to repeat your processes over and over. If that were the case, then why bother buying a machine to save time in the first place, right? So, when looking at the best food processor for Indian cooking, you want to make sure that you get something with high-capacity jars (at least 1.5 liters) to help make things more convenient. If, however, you live on your own, then a mini food processor will be much more helpful as it will ensure that you aren’t taking up so much space in your kitchen. As we mentioned, the purpose of getting a machine like this is to help you minimize the amount of time you have to spend in preparing meals. While some people may think that spending all day in the kitchen is noble, the fact is that you have other things you could be doing with your time. 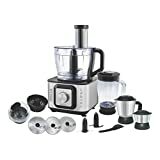 So, when searching for a food processor, try to find one that comes with extra accessories and abilities to make your life easier. Ideally, you will get a device that can blend, juice, grind, mix, and everything else you need so that you aren’t limited to the kinds of meals you can make. Finally, one good way to know if your processor will get the job done is to look at the size and speed of the motor. The higher the wattage, the better the performance and the longer it will be able to last without overheating or overloading. One thing to keep in mind, too, is that two-in-one units will share the same motor, so you won’t get the full amount of power for each side. For example, if one of these machines has 800 watts, it will be more like 500-600 watts of performance for each side (blender and processor). As far as kitchen brands go, Philips is internationally recognized as one of the top companies. For that reason, we are starting off with the HL1660 model. This is a single unit, meaning that you can only do one thing at a time on the same base. As we’ve mentioned already, this setup is ideal if you’re looking for something that can provide higher quality results as you get the full force of the motor each time. Unfortunately, however, you are limited in how fast you can work as a result. As far as accessories go, this machine has a wide selection of them so that you can do almost anything you can imagine. The blending jar is perfect for shakes and smoothies, the processor is ideal for pastes and chutneys, and the kneading jar is designed for making Atta dough quickly and efficiently. To help you get the most out of this machine, it comes with four different blades that are designed for various purposes. Whether you want to slice, chop, shred, or cut, this machine can do it all. It even comes with a citrus juicer. 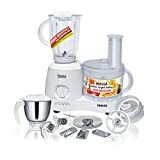 Other features of this processor/blender are non-slip suction feet for stability, an automatic shutoff feature for safety, and a two-year limited warranty on parts and labor. If you are in the market for a high-quality mixer, then Singer is a brand that you should be familiar with already. In this case, however, you get a multi-functional two-in-one unit that can make your kitchen life so much easier. What sets this processor apart from the crowd is that it comes with a host of fourteen accessories. This way, you can make practically anything from scratch and have the best results possible. Although the motor is not as powerful as other models, it is more than enough to make some fabulous dishes. What we like about this machine is that it comes with six different blades. Each one is specialized for a unique task, meaning that chopping, slicing, and shredding has never been easier. Each one is made with stainless steel as well so that they will last forever as long as you sharpen them regularly. 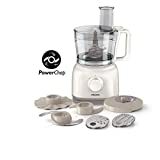 Overall, this device works well as a processor, juicer, and mixer, and enables you to make chutneys, pastes, smoothies, and dough. There is almost nothing that this machine can’t do. Best of all, it comes with a two-year warranty on parts and labor. If you’re not in the market for a processor that can provide large amounts of food for the whole family, then you might be wondering what options you have that can work for single servings or apartment living. In this case, the Philips Daily Collection is built for smaller portions so that you don’t have to make tons of food at once. As far as food processors go, this one is remarkably good at what it does. While it can’t blend or grind, it does chop and slice foods quickly and efficiently, making it ideal for many dishes that require processing. The best thing about this machine is the finely tuned motor and the wide mouth opening, which makes the whole process much smoother and more efficient. To give you some more versatility, though, this product comes with an emulsifying tool and a kneading blade so that you can do more with it than just chop or slice. Best of all, cleaning this machine is a breeze as all components are dishwasher safe. Finally, this device comes with a two-year limited warranty. So far, we’ve seen international brands of processors, but now we shift our focus to a local company that makes some amazing products. Inalsa is a well-known brand in India and has made a name for itself as making some high-quality materials. In this case, the Wonder Maxie Plus is a fantastic two-in-one model that will help you out all of the time. What we like most about this device is that the motor is much stronger than other double units. This means that you can get better results each time, despite the fact that the power is split between the blender and the processor. Overall, you won’t notice too much of a difference compared to a single unit. The other thing we appreciate is all of the accessories that you get. 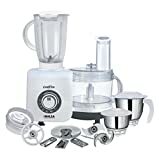 It comes with six different stainless steel blades, multiple jars for mixing and grinding, and even a citrus juicer to complete the set. Overall, this machine is ideal for juicing, chopping, shredding, and grinding. There are three speed settings plus the pulse so that you can get the most out of your time. Finally, we also like the fact that the jars are high-capacity and unbreakable. They even come with lids and handles for easy pouring and measuring. To cap it all off, this set comes with a five-year limited warranty, which is amazing. Next, we have another high-quality machine from Inalsa. The Fiesta is a slightly smaller version of the Maxie Plus, but it still comes with tons of features and accessories to make your life easier in the kitchen. First of all, you get different attachments for this machine. There are three jars, five blades, and a citrus juicer that enable you to make all kinds of dishes. 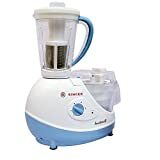 The blender comes with multiple stainless steel attachments to make more than just smoothies, and there are a few flat blades that are designed for shredding and slicing as well. You can even grind and mix dough if you want in the steel jar. The other thing that we like about this machine is that it has advanced safety features such as overload protection and a locking mechanism to prevent accidental starting. It also has non-slip suction feet to give you more stability as you work. Finally, this machine comes with a five-year warranty. Overall, if you want to maximize your productivity in the kitchen, you want to get a two-in-one processor/blender. However, if you want to maximize your level of performance in the kitchen and get better results, then the Spherehot FP-01 is a great option for you. We love the power and speed of this machine; using an 800-watt motor, you can mix, chop, blend, and grind whatever ingredients you want in far less time than with other models. Each jar is made to be unbreakable and can provide enough food for the whole family. Overall, this is a remarkable machine that can do wonders for you. It even comes with a two-year limited warranty. Next, we have another local company product: the Bajaj FX7. This is a two-in-one unit, meaning that it is ideal for families that want to maximize their productivity in the kitchen. As far as performance goes, you get fifteen different accessories with this product, which means that you should be able to create any dishes you want, whether it’s chutneys, smoothies, pastes, or dough. You get four stainless steel blades, a variety of jars, and even a spatula to help you out. Overall, this product will streamline your food preparation process. We’ve already seen the Wonder Maxie Plus, but this is the upgraded version of that model. With a robust 800-watt motor and eleven different accessories, this is a wonderful addition to any Indian kitchen. The materials are high-quality with unbreakable ABS plastic, rust-proof stainless steel, and a motor that won’t quit. You get five blades for versatility and two steel jars for grinding and mixing dough. It even comes with a citrus juicer for maximum benefit. When compared to the Maxie Plus, this has a bit more power and versatility, making it a great option for anyone. It also comes with Inalsa’s standard five-year warranty. So far, we’ve seen some pretty powerful processors, but none are quite as robust as the Multipro from Kenwood. With a 900-watt motor and a single unit design, you can create any dish in far less time than you would with another product. We love the materials used in this machine; they are high-quality and built to last, meaning that you should be able to use the Multipro for years to come. It comes with a processor and a blender, as well as a single serving option so that you can get more mileage out of it than with other products. All of that coupled with six speed settings means that this is one of the best processors in India. Finally, we come to our last model, which is a KitchenAid processor. While this is not as powerful as some of the others we’ve seen, you can still get a lot of use out of this product. The first thing we like about it is the design, which is either a brilliant red or white color. The size and weight of this machine make it sturdy and reliable. With a 300-watt motor, this processor is ideal for chopping, slicing, and mixing. You won’t be able to grind or blend ingredients, but it’s still remarkably versatile for a single unit device. In all, it comes with nine accessories, including three reversible blades. There are two speed settings and a pulse for easier processing, and it comes with a two-year limited warranty. When looking at all of these food processors, we like models that have the most versatility and functionality, meaning that we prefer devices that can do everything you need in the kitchen, whether it’s blending, chopping, mixing, grinding, or juicing. So, with that in mind, our top two picks would have to be the Singer FP-57 and the Inalsa Wonder Maxie models. If, however, you are in the market for a food processor only, then the KitchenAid or the Kenwood Multipro are your best options. In the old days, you could spend all day preparing a single meal, which meant that it was time-consuming and a laborious effort. However, with modern technology, you can get everything done in a fraction of the time, provided that you have the right tools.